How did you do with last week’s Mystery Creature? It was an Antarctic icefish, did you guess it? There are a number of different types of Antarctic icefish but this one is from the Channichthyidae family. These fish are found in the cold waters off the Antarctic, as their name suggests. They are capable of surviving in waters that often reach temperatures below 0oC in the Winter months. There are some very unusual features to this fish. When first discovered in 1927 they were observed to be scaleless fish with pale, sometimes translucent skin. Further investigation revealed that these fish are unique among vertebrates in that they do not contain any red blood cells. It appears they lack haemoglobin, a protein used by red blood cells to bind and transport oxygen around the body. Haemoglobin also binds iron and is responsible for the red colour of oxygenated blood. So how and why do these fish survive without this oxygen carrying protein? It would seem that this is an accident of evolution, the haemoglobin gene has mutated resulting in a non functional gene, however the fish has managed to adapt and survive. In order to do this it have developed larger hearts and wider vessels in their circulatory system. The water within which it lives has high levels of oxygen which it absorbs directly through the body (hence the thin, scaleless skin) as well as through the gills. Without haemoglobin it carries only 10% of the normal levels of oxygen within its blood. The cardiac system of the icefish has to work at a much faster rate in order to compensate for this. Antarctic icefish also produce an antifreeze protein to prevent their ice crystals forming within their bodily fluids under such cold conditions. 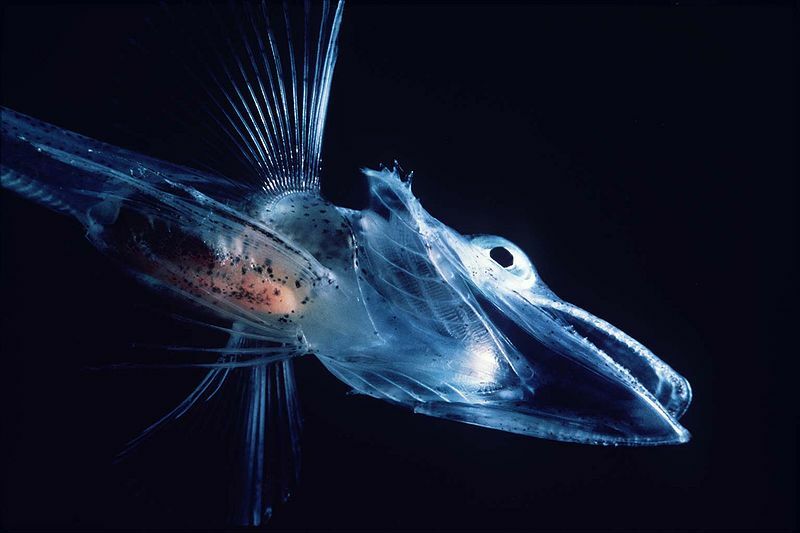 This is an Antarctic Icefish living far north. Yes Elke, you got that quickly! An interesting little fish, I will write a little more about it at the end of the week. Thanks and have a great week!